Even gurning, gun-toting monsters have their softer sides. Just ask Dum Dum, the hero of Monster Shooter, who stamps through 60 alien-infested levels reducing anything in his way to viscera and goop after his beloved kitten is abducted. Though we're sure any answer you might get would involve more firearms than words. 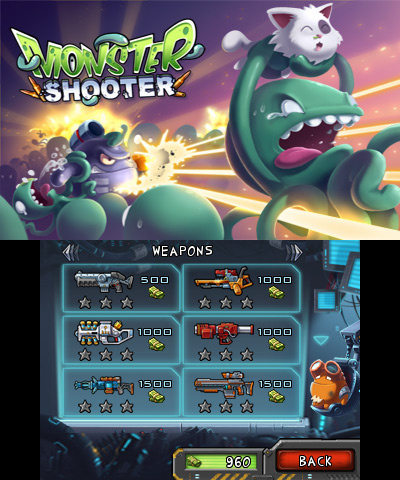 Monster Shooter is a top-down 'twin stick' shooter, with the role of the absent second stick bestowed upon the face buttons. You can move and fire in any direction independently, as is the standard, and there are touch screen buttons to use other helpful items such as medikits, mines and grenades, as well as for cycling through weapons – though it's easier to use the shoulder buttons for that purpose. It can feel a bit awkward to use just four buttons to aim 360 degrees around you, but thankfully there's automatic aim assist that alleviates this problem to some extent. It's not perfect, however: sometimes it doesn't feel as if you're in full control, as if the game is taking over and slaying the enemies for you. You can hit A to fire right, but from there the auto-aim will take over and choose which foe to target, for example. 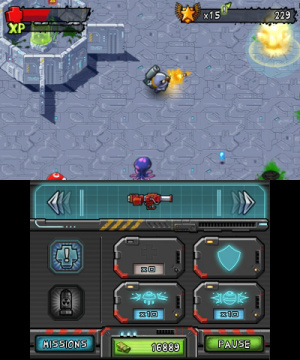 It's a shame there's no touch screen aiming, which would be ideal for this sort of game. You have to clear each of the arena-like levels of extra terrestrial menaces – various octopuses, armadillos and ogres – which pour in from every side of the stage in waves before honing in on your position. Battles are all about balancing when to stand your ground and when to run to a safer area, and there are often bonus items dotted about to give you a hand: healing kits and a rampage mode that temporarily invigorates your weapons with even more power to destroy. It's a simple set up on the whole, which both helps and hinders Gamelion's shooter. It's very easy to get into and as such it's one of those games that you can quickly bust out for a mindless blast. On the other hand, it's incredibly repetitive. The style very rarely changes throughout the five hour long campaign: you shoot, then you shoot some more and finish up with a little shooting. 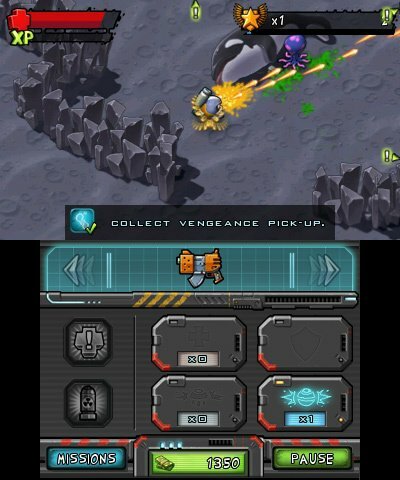 There's not much mechanically wrong, but as most levels' layouts and objectives are extremely similar or identical, with only the odd new enemy added every so often to spice things up, it becomes tiresome. There's a frustrating moment that hints at bigger threats, and thus possible changes, that never actually materialise. That's not to say that there's nothing compelling about Monster Shooter. There's room to experiment with several weapon types, each replete with satisfying – if slightly overbearing by default – sound effects. You start off with a lowly sub-machine gun on your belt, but by completing levels and grabbing stacks of green bills left behind by enemies you can save up to buy new ones that change how the game plays. There are shotguns and rocket launchers, which pack a harder punch but take longer to reload, guns with larger clips that peck away rather than outright obliterate and oddities like an electric shocker gun – good for dispersing / frying a crowd. Weapon selection is almost a way of adjusting difficulty on the fly: you can use the basic SMG for a tougher challenge, or if you want to storm through almost unopposed you'll want to gather up your pennies to purchase the obscenely powerful railgun. It takes an interesting approach to levelling up. An experience meter fills up with every kill – with a nice effect that gives the impression of a clip loading into a gun — and each time it reaches its peak you're allowed to unlock a new skill, such as faster reload time or more ammo per clip. The catch is that these improvements only stay with you on a per mission basis: you're sent right back to zero at the start of each level. It's a nice idea that changes how you play from stage to stage, though it's difficult to plan and predict as the upgrade options are randomised each time, which forces you to cycle through the skills rather than stick with your favourites. A few permanent upgrades are available in the shop, but the choice isn't huge. There's a survival mode alongside the campaign, too. It's fun to see how long you can last as the hordes increase to ridiculous numbers – a fairly long time, if you don't get bored and have a railgun on your side – but without any online leaderboards it's a bit flat. Last for a while until dozens and dozens of creatures are swarming after you and there are frame drops, though it looks untidy more than anything and doesn't actually cause too much trouble with play. There are also missions to fulfil across both modes; achievements in all but name. These aren't mandatory, though as always with systems like this, there's often an urge to complete that five grenade kill challenge or whatever else is asked of you just for that bit of positive feedback. It looks fairly good: its appealing characters look as if they've fallen off a cereal box and into the world of Super Pokémon Rumble. There are funny touches in the backgrounds, such as none-too-healthy killer whales on the surface of the moon. Sadly there's not much in the way of 3D effect: some parts of the ground stick up a little, and the user interface floats above the action, but that's about it. The lack of the effect in the short CG cutscenes is particularly disappointing. Monster Shooter presents a couple of decent ideas, a campaign of good length and generally plays well — overcompensating aim-assist aside — but it's really let down by a lack of variety. With a few exceptions, were it not for a couple of different enemy and environment types you could be easily fooled into thinking that you were playing the same level over and over again. It's solid enough to be worth a look, but its repetitious nature means it's a game to play in chunks rather than in one monstrous session. I don't understand why there isn't a move option for the stylus. The touch screen would be perfect for moving in 360. I'll stick with the free iOS version and save 8€, thank you very much! Edited: I meant aiming in 360 degrees, not moving. This sounds like it could be fun. Reminds me of Smash TV a bit. I think I might give this a whirl at some point. Thanks for the review! They need to take taxes off Eshop games make it like PSN then I will for sure buy off the Eshop. Well, I actually quite enjoyed that one, so that scores a bit of a shock! Actually tried it on android, but found it unplayable thanks to the frustating touch analog stick. Felt a relief by playing the 3ds version with the circle pad, so yes it controls around 100 times better in comparison, but that's really no surprise. This is a fun little top down blaster, with pretty visuals. Sadly you can't take the aim assistant off, meaning you feel the computer are doing half the job . The 4 shoot buttons I feel is a little unnecessary, why not just have 1 and shoot in the direction the character is facing, like in the good old joystick days? Hopefully a little game patch soon will correct these obviously mistakes or am I dreaming? I will probaubly still get this because it's like undead storm which got 9 stars and draculas undead awakening which got 6 or 7 stars (should of got a better score) and I enjoyed those games. They coul've used the buttons for moving and the circle pad for aiming too. I'd probably do the same if someone stole my cat. It doesn't seem too bad... but doesn't catch my interest. No thanks. this game frickin rocks, great on the go! stylus would have made 3ds cumbersome to hold, so the auto-aim works well enough! 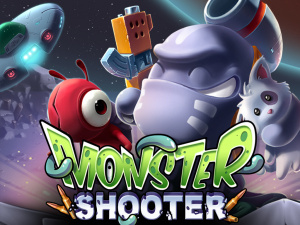 It definitely is repetitive, but Monster Shooter is fantastic otherwise. Whales on the moon? South Park reference! Picked this up on sale for $3! Love the graphics style. this really is a fantastic game. 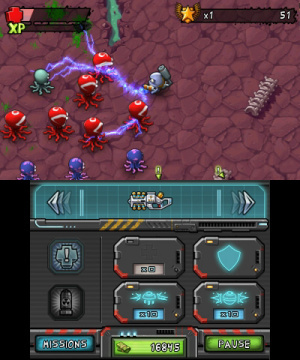 and the 3DS slider is a Massive improvement over iPhone/iPad's "virtual" touch controls. This game is awesome. Just picked me up a copy at the bargain price of $ 1.99! Its very satisfying blasting aliens. I wish they would've made the blood red tho'. It is addictive. Go get this game if you like shooters.